1. Wash, clean, and if the duck was not plucked thoroughly use tweezers to pick out any feathers – do everything you need to do to make it possible to process the meat with the skin after the cooking. 2. Cut out the breast fillets with skin and save them for another time. Rub the duck inside and outside with salt and pepper, tie into a large oven bag, and roast for 30 minutes at 175C. 3. Reduce the heat to 150C and further roast for another 30 minutes, then reduce to 110C and keep for another two hours. The duck fat must be rendered and be cleaрly visible at the bottom of the bag. 4. Let the meat cool down enough for handling. Cut one corner of the bag and pour the fat and juices into a glass jar and put it away into the fridge. Separate all the skin and meat from the carcass except the tail (be careful with the small bones). 5. Put the maryland fillets without skin aside and transfer all the remaining debris into a food processor. Process the content to get a consistent mince. Pull and shred the fillets and cover to prevent it from drying out. * These steps can be completed a day ahead. 6. Use a coffee grinder to process 1/2 cup of brown rice until it looks like a coarse meal. Boil the rest of the rice in plenty of salted water for 20-30 minutes or until it is almost ready. 7. In the meantime dice the leek white, mince or grate the garlic, finely grate a half of the nutmeg, and slice the cup mushrooms. 8. Heat up the wok with some duck fat and cook the leek and garlic on low heat until soft and fragrant. Add the ground rice along with water or stock, prepared nutmeg and mix well. Cook on low flame until the stock is well absorbed and the rice is ready. It may take 10-15 minutes but if needed add more liquid. Add the drained rice and check for seasoning. 9. Check the jar with the duck fat. Leave the darker layer and a little of fat at the bottom and remove the top layer into a different jar suitable for storage. (The duck fat can be used, for example, to make baked potatoes.) 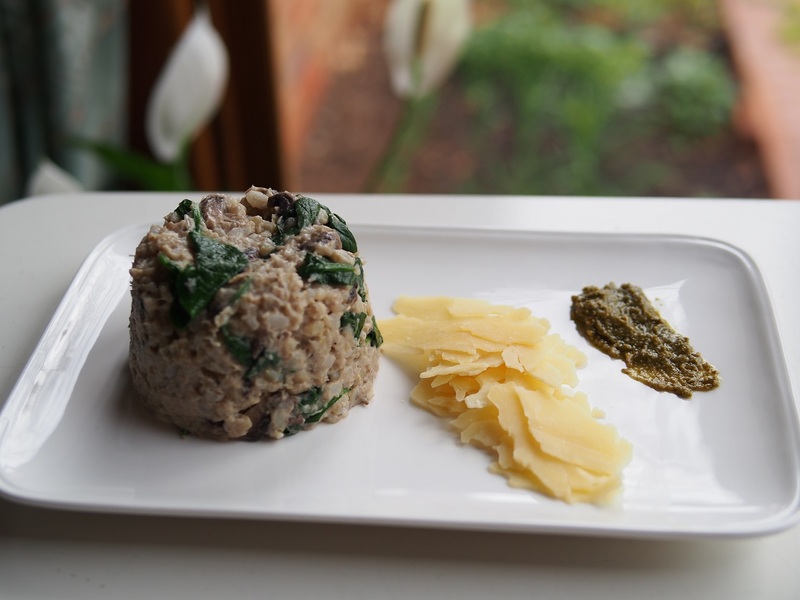 Scoop out the remainder into the risotto, also mix the duck mince in and heat through well. 10. 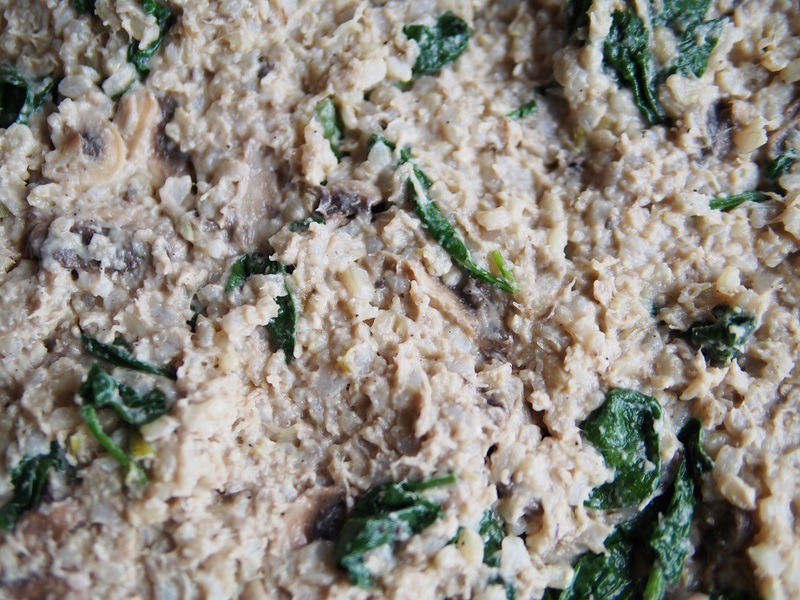 Mix the pulled duck meat, sliced mushrooms, baby spinach and milk into the risotto and just let it to heat through. When serving offer some cracked pepper. Shaved cheese is also an optional addition.